AFTER READING PLEASE CLICK HERE TO ANSWER THE QUESTIONS FOR STUDY ONE. BEFORE READING PLEASE CLICK HERE TO VIEW AN OUTLINE. BEFORE READING PLEASE CLICK HERE TO VIEW MAPS OF THE DIVIDED KINGDOM OF ISRAEL. BEFORE READING PLEASE CLICK HERE FOR A MAP OF ASSYRIA. BEFORE READING PLEASE CLICK HERE TO VIEW A MAP OF THE BABYLONIAN EMPIRE. Habakkuk, Nahum, Zephaniah, and Daniel were contemporary prophets. Jeremiah predicted the fall of Jerusalem. Habakkuk spoke of Babylon's invasion. Zephaniah predicted Judah's fall. Nahum declared Nineveh's fall. Daniel was taken into captivity by the Babylonians as a young man when Jeremiah was in his later years. Events recorded in Jeremiah make dating possible. A large portion of the book was written while Jerusalem still existed as the Lord had instructed him on more than one occasions. (30:1-2, 36:2) Some scholars believe that Jeremiah finished writing his book will in Egypt after Jerusalem's fall. Judah would fall to Egypt in 609 B.C. and then Babylon in 605 B.C., 597 B.C. and for a third and last time in 581 B.C. Jeremiah saw his prophecies fulfilled though he didn't like seeing it. After Judah's fall he was taken to Egypt where he died. 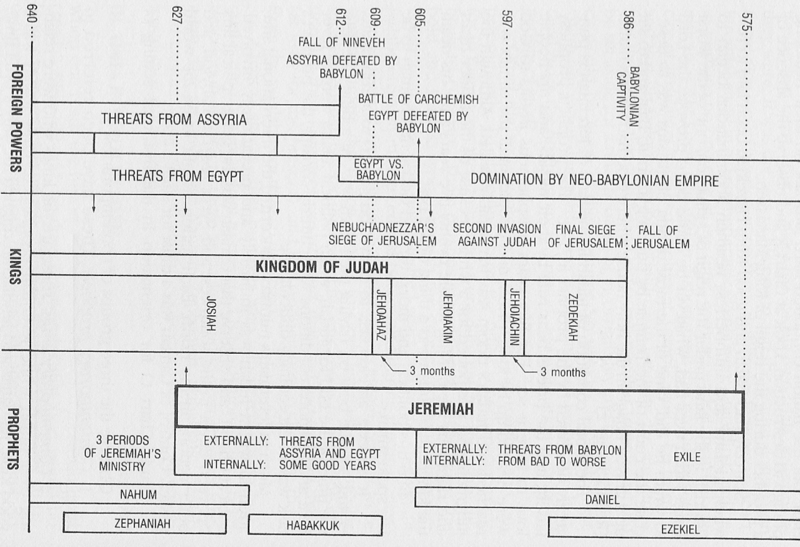 Jeremiah's book is a combination of prophecies and historical record (though not in chronological order). His main audience was the people of Jerusalem and Judah of his time. However, he does state prophesies to and about all the countries surrounding Israel at the time. The middle of his book, especially 30 thru 33 contain rich prophecies of the Messiah thus making his book fitting for all ages. The historical lessons are as relevant today as they were then. Jeremiah, a devout believer knows of the coming wrath against Jerusalem and Judah and its fall through the Lords revelation. The Lord chose him to pass that message onto Judah, Jerusalem and its leaders and kings. Judah's sin and idolatry continued during most of Jeremiah's time in spite of reforms made by King Josiah. Mighty armies surrounded Judah and constantly threatened them. Thebes was destroyed at the hands of Ashurbanipal’'s Assyrian army in 663 B.C. Judah had lost much of its cities and fortresses at the hands of the Assyrians. In the 620s B.C. the Scythians (outlandish barbarians) invaded Canaan. They came quickly on horses from southern Russia (just north of Assyria). They destroyed the Philistine cities of Ashkelon and Ashdod, going along the Mediterranean Sea and right past Judah. They went as far as the Egyptian boarder who paid them off to stop them from destroying them. Nineveh fell in 612 B.C. at the hands of the Babylonians. Prophets like Micah generations earlier had predicted that Babylon would be God's hand of judgment against Judah. In 609 B.C., three years after Nineveh fell Judah's king was so confident that he attacked Egypt whose army was being sent to assist Assyria in their wars. Judah lost and became subject to Egypt. In 605 B.C. Babylon attacked and defeated Egypt at the battle of Carchemish (2 Kings 24:1-7) making Judah subject to Babylon. After the battle of Carchemish, Nebuchadnezzar, as crown prince of Babylon, advanced to Jerusalem and then quickly left for Babylon to be crowned king when his father died. Then he returned to Jerusalem. Nebuchadnezzar spared King Jehoiakim, who had rebelled against him when he left to be made king. However, Nebuchadnezzar carried off several of the princes of Judah, among them was Daniel, Shadrach, Meshach, and Abednego. The book is part prophecy and part historical record. The book has many forms. The prophecies are mostly poetic. Jeremiah is one of the longest books of the Old Testament with fify-two chapters. Scholars have placed it with the other major prophets; Isaiah, Ezekiel, and Daniel. Laminations is also place among the major prophets even though it is only five chapters long because most believe Jeremiah wrote it. The classifications major and minor prophets does not have to do with the message within the book. Rather it has to do with the volume of work the within the book. 1:1-7:15; ch. 26; 7:16-20:18; ch. 25; chs. 46-51; 36:1-8; ch. 45; 36:9-32; ch. 35; chs. 21-24; chs. 27-31; 34:1-7; 37:1-10; 34:8-22; 37:11-38:13; 39:15-18; chs. 32-33; 38:14-39:14; 52:1-30; chs. 40-44; 52:31-34. 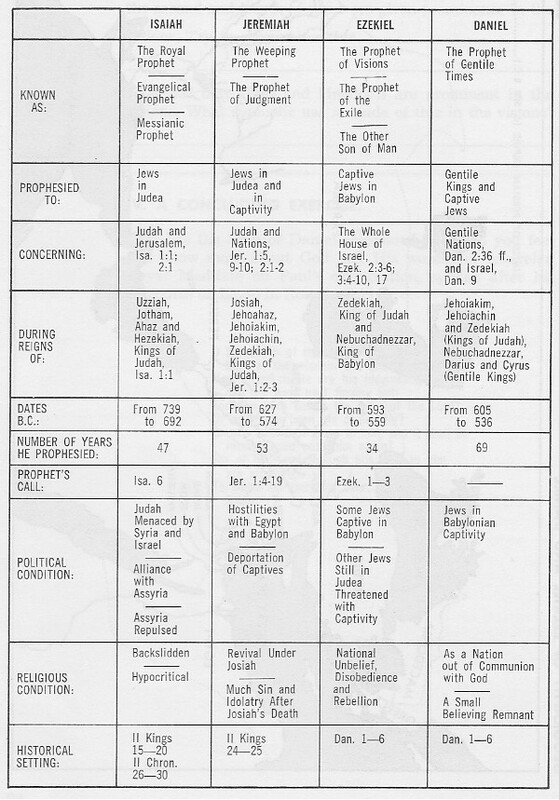 The outline on this site represents an analysis of the book of Jeremiah in its present canonical order.